As electric field, that is, force per unit charge is a vector quantity; it can be used to represent overall effect of electric field in system of electric charges. Similarly electric field can be used in pictorial form to describe the overall intensity of the field. 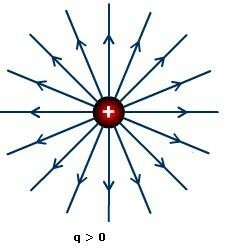 This pictorial representation or form is called electric field lines. There are certain properties, rules and applications of electric field lines. The idea behind utilizing electric field lines is to represent nature of electric field and making it simpler to apply in complex physics problems. Electric Field Lines can be defined as a curve which shows direction of electric field, when we draw tangent at its point. The concept of electric field was proposed by Michael Faraday, in the 19th century. He always thought that electric field lines can be used to describe and interpret the invisible electric field. Instead of using complex vector diagram every time, electric field lines can be used to describe electric field around a system of charges in a better way. The strength of electric fields is directly proportional to the lengths of electric field lines. Also, since electric field is inversely proportional to square of distance, the electric field strength decreases, as we move away from the charge. The direction of arrows of field lines depicts direction of electric field, which is pointing outwards in case of positive charge and pointing inwards in case of negative charge. Adding further, the magnitude of electric field is well described by the density of charges. The lines closer to charge represent a strong electric field and the lines away from charge correspond to weak electric field. This is because, the strength of electric field decreases as we move away from charge. It is not necessary to draw as many electric field lines in order to key out the electric field around the charge ‘q’. Even if we draw few lines along the charge, we can trace the nature of electric field by judging the relative density of field lines. Example: Why electric field lines never intersect each other? Electric field lines tell the nature of electric field in a system of charges. They also reveal about direction of electric field strength at a point in a region of space. 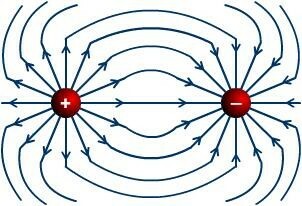 If the electric field lines intersect, then there must be distinctly two electric fields with different directions. This is not possible as a single location has only one direction and magnitude of electric field associated with it. The figure below describes it well.